The 166th battalion Border Security Force (BSF) personnel celebrated Raksha Bandhan with a group of school children at the Indo-Bangladesh border near Malakar Basti at Dharmanagar. The schoolchildren tied rakhi to jawans, including some officers. It is to be mentioned here that the school children of Montessori Sikhsa Bhawan tied rakhi to jawans the mark the beautiful relation of brother & sisters. Battalion Commandant Sitaram Beruah said that It is a moment of pride for us that the school children loves us so much that they have tied rakhi to us and we are highly delighted with this gestures from the school children’s. Accepting Rakhi from the school children, BOP Commandant Vhartual stated that they are extremely happy after receiving rakhi from the school. They believed that these school children are like their own sister and will always protect them. School girls tied rakhi to the army personnel and exchanged sweets. Rakshabandhan is a Hindu festival that celebrates the love and duty between brothers and sisters. The beauty of brothers and sisters relationship cannot be explained in words. It is a feeling that binds the two hearts and Rakhsa Bandhan is the occasion to mark this relationship. Every household celebrates Rakhi, but the Jawans at the border are those heroes who are constantly protecting us and are away from their home during such occasions. 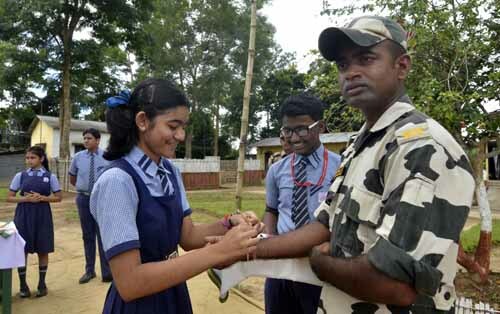 Realizing the role of the jawans in every one’s life, the school children tied Rakhi to the wrist of the Jawans in Tripura to make the Jawans realize they have their sisters everywhere they go.